When you file a construction lien foreclosure lawsuit, you must also record a lis pendens in the official (public) records against the property. This lis pendens serves as written notice that there is a lawsuit concerning the real property, and more specifically, title relating to that real property. If the property is then sold or rented, the buyer or tenant will ultimately be bound by a final determination relating to the lawsuit concerning title to the property. This is the value in recording a lis pendens and why it is a MUST in any foreclosure lawsuit. (This is the same value in any mortgage foreclosure lawsuit and why lis pendens are recorded in these lawsuits too.) 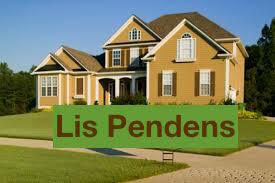 A lis pendens will show up in a title report. In most instances, title companies will not issue a title policy if there is a lis pendens or may require a certain amount of money escrowed as a result of the lis pendens and pending action in order to issue a title policy. Also, a buyer, in particular, and a tenant are not going to want to invest in property where the title to that property is at-issue in a lawsuit. Hence, the lis pendens impacts the sale and potential re-financing of the property. When the pending pleading does not show that the action is founded on a duly recorded instrument [e.g., mortgage or Declaration of Condominium] or on a [construction] lien claimed under part I of chapter 713 or when the action no longer affects the subject property, the court shall control and discharge the recorded notice of lis pendens as the court would grant and dissolve injunctions. Therefore, if the lawsuit (i) does not affect title to the real property, (ii) is not based on a construction lien, or (iii) is not based on a duly recorded instrument, such as a mortgage, an owner of real property is going to move to dissolve the lis pendens so that title to their property is not impacted by the lis pendens. This is, at least, what an owner should do. What happens if a lis pendens is recorded but the lawsuit is not a construction lien foreclosure lawsuit or founded on a duly recorded instrument such as a mortgage? For example, what if there is a lawsuit for the specific performance of a purchase-sale contract involving real property? In this instance, the party suing for the specific performance of the real property to be sold to it will want to record a lis pendens to put the public on notice that there is an action concerning title to that property. But, this type of lawsuit is not founded on a duly recorded instrument or construction lien. For this reason, the owner of the property will move to dissolve the lis pendens so that they can sell the property or re-finance the property, as the case may be. A recent decision in Regents Park Investments, LLC v. Bankers Lending Services, Inc., 41 Fla.L.Weekly D1688c (Fla. 3d DCA 2016), exemplifies the scenario of a lis pendens being recorded in a dispute concerning the sale of real property and the owner of the property moving to dissolve the lis pendens. The buyer filed a lawsuit for specific performance to force the owner to sell the property to it. The buyer also recorded a lis pendens (as the buyer did not want the owner to sell the property to another buyer). The owner moved to dissolve the lis pendens so that it could do what it wanted with the property without the impact of the lis pendens. The Third District explained that the burden was on the proponent of the lis pendens—the buyer that sued for specific performance that recorded the lis pendens—to establish a fair nexus between the claim asserted in the lawsuit and the real property’s title. Regents Park Investments, quoting Nu-Vision, LLC v. Corporate Convenience, Inc., 965 So.2d 232, 234-36 (Fla. 5th DCA 2007). This fair nexus means the proponent of the lis pendens must make a minimal evidentiary showing they have a good faith, viable claim in the lawsuit concerning the property’s title. Id. Applying the standard of a minimal showing that there is at least some basis for the underlying claim and a good faith basis to allege facts that would at least state a viable claim, we conclude that Regents [buyer suing for specific performance that recorded lis pendens] met that standard. Regents’ showing that its claims arose out of a written contract for sale of the subject properties established a “fair nexus” to the properties and its Interrogatory answers swearing that it was ready, willing and able to close on the closing date, together with evidence that Bankers [owner] was not able to close because of the outstanding lot clearing liens against the property, provided a sufficient minimal basis to support either a claim that Regents could have performed or that its performance was excused. Consequently, we find that the trial court should not have discharged the lis pendens and reverse with instructions that it be reinstated. This fair nexus standard requiring a minimal evidentiary showing provides an advantage to a buyer that sued for specific performance and recorded the lis pendens. It simply requires the buyer to proffer some evidence to support that they have a good faith, viable claim concerning title to the property. If the buyer cannot do this, the lis pendens should be dissolved. On the other hand, if a buyer supports this fair nexus standard, then the lis pendens will not be dissolved meaning the owner’s real property will continue to be impacted by the lis pendens. In such scenario, the owner may ask the court to require that the proponent of the lis pendens furnish a bond in the event it turns out that the buyer’s claim is not valid meaning the lis pendens was wrongfully recorded. This entry was posted in Lien and tagged construction lien, construction lien foreclosure, dissolve lis pendens, Florida Statute 48.23, foreclosure, lien foreclosure, lis pendens, recorded lis pendens, specific performance by David Adelstein. Bookmark the permalink.